It’s official: Alta Bicycle Share, the company that runs Citi Bike, has a new owner, an infusion of cash, and a fresh face at the top — longtime transit executive Jay Walder. At a press conference this afternoon, the new team promised to correct Citi Bike’s blunders and double the system’s size by the end of 2017. The same ownership group will also be running Alta bike-share systems in Chicago, San Francisco, Washington, and Boston, among other cities. While today’s news signals potential changes in those cities as well, the most immediate changes — along with Alta Bicycle Share’s headquarters — are coming to New York. Citi Bike’s reboot has been months in the making. Top executives from Equinox Fitness, itself a division of real estate giant The Related Companies, burst onto the bike-share scene in April with an unsuccessful last-minute bid for Bixi, the bankrupt Canadian supplier of Alta’s bike-share components. Related execs resurfaced in July, when word came that they were on the verge of buying out Alta. After months of negotiations, the deal is now official, with a company backed by Related executives and other investors, called Bikeshare Holdings LLC, acquiring all of Alta Bicycle Share. Alta is getting a major cash infusion — $30 million from Bikeshare Holdings LLC, which is led by Equinox CEO Harvey Spevak, Related CEO Jeff Blau, and investor Jonathan Schulhof. Citi has extended its initial $41 million, five-year sponsorship of NYC bike-share by promising an additional $70.5 million through 2024, contingent on system expansion. Goldman Sachs Urban Investment Group, which has already helped finance Citi Bike, is increasing its credit line to Alta by $15 million. The deal includes $5 million from the Partnership Fund for New York City, an investment fund backed by the city’s big business coalition, to expand Citi Bike to more neighborhoods. That expansion is set to roll out in stages over the next three years. Today, the system has 330 stations and 6,000 bikes. Alta and DOT promised today that by the end of 2017, it will double to over 700 stations and 12,000 bikes. The first round will bring the system to neighborhoods that have long been promised bike-share, such as Long Island City and Greenpoint, as well as additional parts of Williamsburg and Bedford Stuyvesant. The second phase will expand the system to just north of 125th Street in Harlem, south to Red Hook, Park Slope, and Prospect Heights, and to a large section of Astoria. It does not include Roosevelt, Randalls, and Ward Islands. In addition, Alta hopes to increase revenue by raising membership fees, which will go from $95 to $149 for an annual pass. A discount $60 annual fee for NYCHA residents and members of participating credit unions will remain. No word yet on how the fee structure might change for daily and weekly users. Council Member Jimmy Van Bramer, who represents the area where today’s announcement was held and has been pressing for Citi Bike expansion since the system launched last year, was elated with today’s news. “We want these blue bikes as soon as possible,” he said. Today’s deal may also align with the bike-share aspirations of Jersey City Mayor Steven Fulop, who hopes to add up to 600 Citi Bikes to his city’s streets by next year, according to the New York Times. The big surprise from today’s announcement is that transit heavyweight Jay Walder is taking over as Alta CEO. Walder, a Queens native, is best known in New York for his brief but eventful two-year stint as MTA chair. Walder quit the MTA in 2011 to take the top spot at Hong Kong transit company MTR Corporation, before resigning from that position in July over a delayed high-speed rail link. Walder also served as planning and finance director at Transport for London from 2001 to 2007, when the agency implemented congestion charging and dramatically expanded its bus operations. Walder made clear this afternoon that his first job is to right the ship at Alta, which has struggled with supply chain problems, a poor user interface at kiosk screens, broken docks, overwhelming bike maintenance demands, and subpar software and other technology. The company will be hiring its first vice president for technology this week, and Walder promised a massive repair program for bikes and stations over the coming winter. What about the other Alta bike-share cities? “Look, it’s the first day for me. We don’t have all the answers,” Walder said. “Arrangements in each city are a little bit different.” Walder said he will be traveling to each of the cities where Alta does business to work out a plan for each system with local transportation officials. Today’s press conference overflowed with a mix of confidence and relief. Citi Bike will finally have significant financial resources and an experienced executive at the top, after 18 months of sputtering from one crisis to the next. The exact path toward system expansion and a better customer experience has yet to be determined, however. Citi Bike runs on an inferior software platform compared to older Alta systems, and Alta no longer has a working relationship with Bixi, the quasi-public Canadian company that supplied bikes in New York and several other cities before going bankrupt earlier this year. A Montreal furniture mogul scooped up Bixi’s assets in April, gaining control of critical patents, even though the team of Related executives and other investors outbid him. It remains unclear how the new Alta leadership will address these problems. Alta recently launched a bike-share system in Seattle using new, non-Bixi components. Walder wouldn’t say if New York would be getting a version of what’s been deployed in Seattle or if the company has come to an agreement with Bixi’s new owner. During the press conference, Walder took stock of the moment. “What we are here talking about today was unimaginable only a few years ago,” he said. He was reflecting on Citi Bike’s popularity among New Yorkers, but he just as easily could have been talking about someone with the transit management pedigree of Jay Walder leading a global bike-share company headquartered in New York. This is FANTASTIC news. However, my one question is, why is the upper east and west sides and harlem in phase 2? Full disclosure: I live in the UWS. But beyond selfish reasons, doesn’t it make financial sense to first expand to the most populated areas? Also, think of the revenue from tourists in central park. Wow, this is amazing, and so many headlines to choose from here: how about Citibank expanding it’s sponsorship? Does the public get to see any details of the “up to $70.5 million through 2024” sponsorship deal? We better before any tax dollars are invested. More parochially, Citibike now needs a pay per ride plan like MetroCard. A big chunk of annual Citibike key holders are regular bike commuters who use Citibike to travel travel the last mile on subway commute days or weekends. $150 for an annual pass is expensive for anyone doing 15-20 trips a year — like a lot of people I know. The phase 1 areas were promised bike-share as part of the initial rollout during the Bloomberg administration, though that plan shrank after Hurricane Sandy. I’d imagine plenty of folks in those areas would not be happy to feel passed over again. in short: Those areas are probably getting it first in order to fulfill what was initially promised. Awesome news! This is just great for everyone. These guys who put the deal together, and the companies backing them (yes, even Citibank) deserve a ton of credit. Seems like one of those rare situations where everybody wins. No offense to Pendergast, but I wish Walder had never left the MTA. Like David Gunn he showed up in a crisis, had to allocate the pain, and got the blame — but did the right thing. Ultimately, like Gunn at NYCT, doing a better, more efficient job is in everyone’s interest. If he didn’t decide to leave/Cuomo didn’t push him out, a lot of vested interests would be having their feet put the fire right now. I wonder what it would cost if every city involved pitched in to buy Bixi’s assets and make them public? Everyone would benefit from open source bike sharing. Yes, everyone would. And America would also benefit from having bikes established as a form of public transportation. But the ghosts of the Reagan era, which gave birth to the most miserable of all alliterations (“Public-Private Partnership”!) haunt even the most competent and forward-thinking people in power. I’d also guess that those areas were picked in the initial rollout because they had higher demand projections. Wasn’t the initial rollout to include the UES & UWS up to 79th Street? I’m not happy being passed over again. The 5 boroughs are covered in suggestions on the online map. It was expected that it would follow shortly though in summer 2013. But then there were those supply issues so the expansion to 600 docks was put on hold. Even though I live in Jackson Heights and only go into work in Manhattan 1 or 2 times per week, I find Citibike to be a bargain at the current rate and still will even at the $150 membership. On those days I probably use Citibike 3 to 5 times per day, and easily save the cost of Metrocard rides. But even more important is the time savings and knowing I can jump on a bike if I need to. It is not that simple. That would put bike share management under MTA management. They don’t have the best record, and they are very expensive at managing things due to sticky unions. So they would either have a bloated sub-department managing a new dedicated bike workforce, with asinine work rules written in union contracts, or they would have to subcontract much of the work anyway (like bike repair, bike storage load balancing, station management, payment processing etc) while being subject to the more lengthy regulations of public procurement. So I don’t see what it is to gain, for the citizens, on a MTA buyout of City Bike. A) What is there that says that Citi Bike would have to be under MTA? C) Public procurement has its problems, to be sure, but at least it’s a public process designed to maximize value (and some social effects) and provide transparency. Private processes may move more quickly but there’s absolutely nothing about “more quickly” that equals “better.” And I think the whole roll out of Citi Bike certainly suggests that the previous owners were not that great at moving quickly either. D) Here’s why I think everyone would benefit: Governments are a lot better at providing public goods than private industry. From military contractors to private prisons, I think there’s more than ample evidence that the whole “government is always the problem” mentality has proven to be deeply evil, promoting clear inefficiencies, grotesque corruption, and social effects so appalling that I can imagine even Saint Reagan might find them shocking (though I doubt it). Citi Bike could’ve been a statement about the efficiency and value of government. Instead it’s just a hobbling advertisement for a institution whose recklessness perfectly symbolizes the “own the laws, then pretend you’re not using the government” lies that have come close to destroying the world..
As someone in the agency i can tell you the truth is the opposite. Walder did nothing but take credit for other’s work, treat employees badly, and as soon as he saw that the future was bad news he ran. People give him credit for the train arrival clocks, but that was a 7 year project (years late) and the turn-on was set before he was hired. As for the bike supply, I wonder if theyll take a seasonal system, like Boston, pull those stations out for winter, and paint them in Citibike colors. Then in the spring launch Boston with bikes from a new supplier. Seems to me the “suggest a location” website should also have a way for people to chime in a loud resounding “not here”. A thumbs down as well as a thumbs up. Otherwise, the information is skewed. I wish it would expand into eastern Queens. Even if you only had bike share stations near major shopping areas or subway stations, it could still be quite useful. For example, have a bunch of stations in downtown Flushing or Jamaica, then have smaller stations of a few bikes each along heavily traveled bus routes. I remember that, as soon as Jay Walder arrived, the MTA stopped suing everybody making a transit app and instead started publishing data and hosting app contests. Capital Bikeshare has a “Daily Key” option that’s superb for visitors and day-trippers. You get a key that’s tied to your credit card, but you pay the daily rate instead of the annual rate. It’s not quite a pay-per-ride option, but it does save a lot of kiosk time (and we don’t have Citibike’s awful kiosks). Two other obvious upgrades that I probably picked up from other posts: 1) integrate Citi Bike’s payment/fob system with MTA fare system, i.e. Octopus Card or another frictionless system even available for single-trip, daily, weekly, or monthly users, thereby greatly increasing ridership and convenience; 2) offer discounts or perks for against-the-current-riding users who incidentally assist in balancing docks, i.e. people riding into Grand Central or Penn Station docks in the morning rush or away in the evening. The latter may even encourage people to do this for recreation and fitness and might compete with paying rebalancers to drive or bike in bumper-to-bumper traffic. I really wish that the base rental period were one hour, not 45 minutes. In my experience, an hour is about what it takes to make most useful inter-borough trips. (Though many trips entirely within the tiny island of Manhattan can take much less time.) I understand that you can dock the bike and take another. Still, the base period should be a more useful one. I have been a CitiBike member since the beginning; and, despite my rarely using the service, I intend to renew even at the higher price. Still, the service’s usefulness would jump enormously if the overtime fees didn’t kick in until a full hour had passed. That’s what stopped me from signing up. It takes me almost exactly 45 min to bike from my home in Brooklyn to my job in Manhattan. It’s pretty much the same story for all of my friends. Better to just use my own bike even though I’d prefer to use Citibike. The price increase to $149 is effective today?!?!?? Talk about quickly burning off your goodwill. No, it is not effective today. An email from Citi Bike to its members says they can still renew or join at the current rate. Alta has not yet given a date for the increase. The company says it will let people know in advance of the change. true, just not worth it to me since I already own a bike and I don’t spend any time in Manhattan outside of going to work. Every other city is 30 minutes. So we get a big bonus at 45. Besides you can always re-dock. I have taken 3 hour rides with 5 or 6 easy re-dockings. Never a problem. So if I were to visit DC tomorrow, I’d be able to get a key right away and start riding? I think you’d still have to use the kiosk or sign up online and wait 7 days for a key. Correct me if I’m wrong. Yeah, they really landed the punch. The communication yesterday seemed pretty clear that people would know in advance *when* prices were going up. Seems a bit like bad-faith dealing here. Strange. Right; as I mentioned, I am aware of the option of re-docking. But that should be a once-in-a-while thing. When every trip will require a re-docking, this is a bit of a counter-incentive to sign up. I will repeat that I am a member, and that I intend to renew. So this quibble hasn’t stopped me from paying. But I wouldn’t be surprised if many people concluded that this would be a hassle and never signed up, or didn’t renew after having to re-dock during every trip. The key has to be bought online and mailed to you in advance. Some cities have storefronts where you can get keys in person, though. A price hike right before the winter? Terrible move. Especially if you have other stations nearby add FMCP. Big enough that bikes are very useful for getting around, even if you take a bus, subway, or drive to the park. Parks department documents suggested creating a bike share system for the park before citibike existed. This time limit will be a bigger issue as the system expands to Astoria, etc. It will be harder to get to all points within 45 minutes. I think they should give members a few “grace” overages before overtime starts to kick in. London allows people to use their keyfob to buy daily and weekly passes, and they have an autorenew option so that they next time you need one, it gives you whatever time period you got the last time without your having to go online and reconfigure it. Or consider a premium membership with 60 minute rides before overages. What about the UES? I’d love to ride 28 blocks in the morning from home to work. Instead, I am crammed onto the train for three stops which takes longer than a bike ride for the same distance. The idea is you’re using it for short trips, not to “pleasure ride.” If there wasn’t frequent redocking, bikes would be even less available than they are. The problem with Citi Bike is that they are unable to competently manage their current service. What Will It Take to Bring Bike-Share to Every Borough? 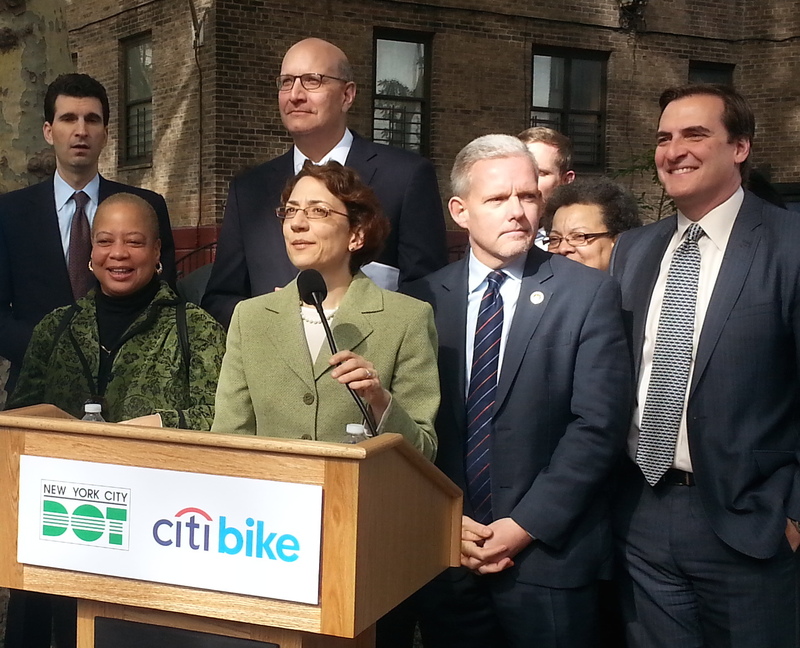 City Council members want bike-share to expand into their neighborhoods in a five-borough network. Officials at DOT and bike-share operator Motivate share that vision, but they said at a hearing today that it won't come cheap. But questions are raised why deliverymen's e-bikes of choice are still illegal.